Excitement in the kitchen! I made my first poached egg and it worked out perfectly. After a quick introduction to the art of egg poaching on Food52 I felt ready to give this challenge a try. 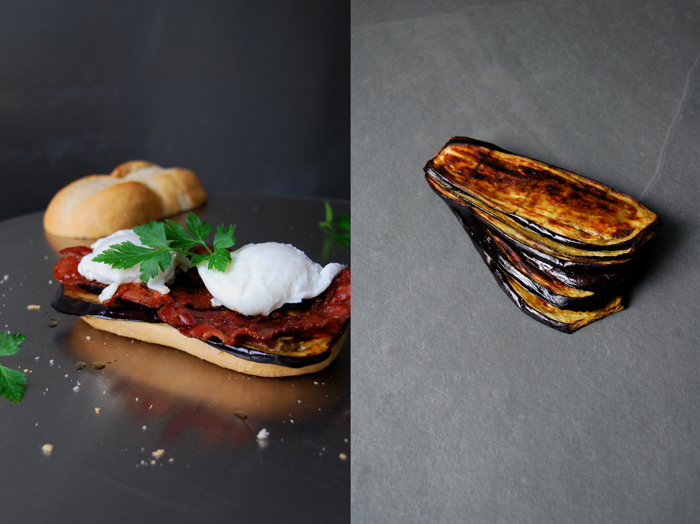 To my surprise, it was much easier than I had expected so I could take my time and focus on the other ingredients for this week’s sandwich, grilled aubergine and crisp bacon. My inspiration came from the great Sabih sandwich. 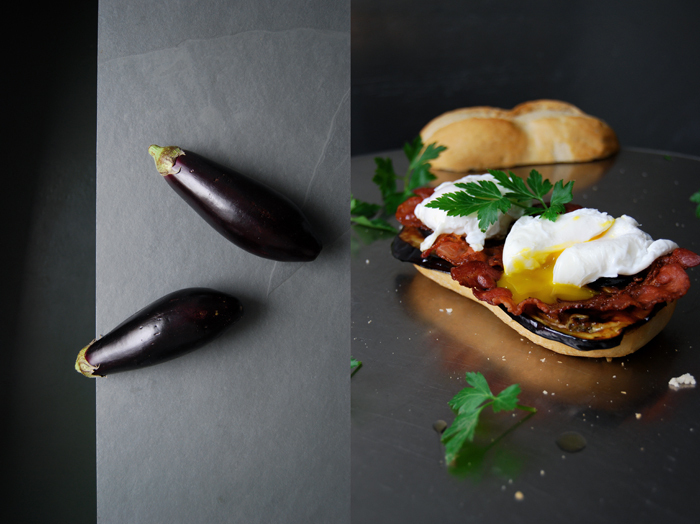 I thought about it in the past couple days, how it combines all that lusciousness between two slices of bread, rich hummus, grilled aubergine and a boiled egg merged to true deliciousness. It could easily be too much but somehow this Middle Eastern sandwich classic does it just right. 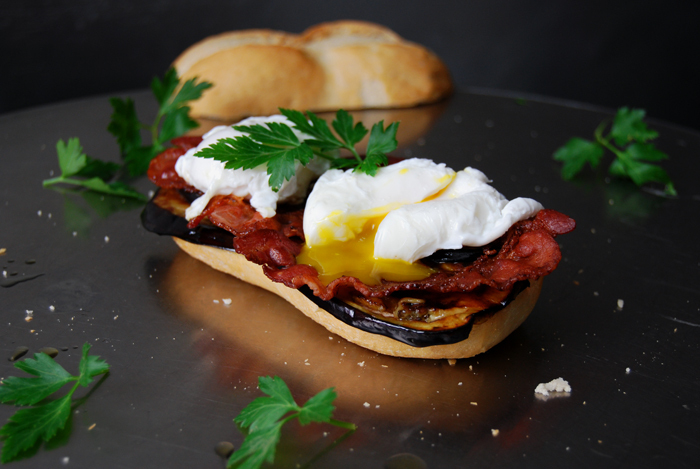 The egg and the eggplant are a great duo, they complement each other perfectly, so I used this idea but added a new flavour, salty bacon. I packed everything in between a large baguette bun and finished it off with some crunchy parsley leaves. I should warn you, this is more than a snack, it’s a proper meal, but anything smaller wouldn’t have worked, this sandwich has the same addictive quality as the scrumptious Sabih! 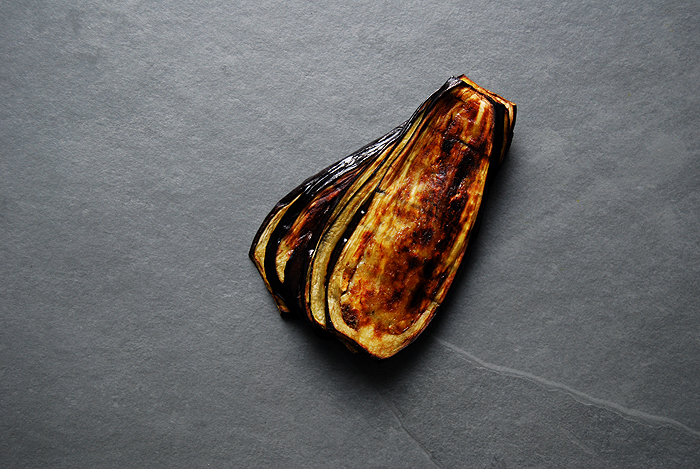 Brush the aubergine slices with olive oil on both sides, season with salt and pepper and put them under the grill for about 6-7 minutes on each side. Watch them as they should be golden, partly brown, but not burned. Take them out of the oven and put the slices on top of each other on a plate, that will keep them moist. Heat a little olive oil in a pan and fry the bacon for a few minutes on each side on medium heat until golden brown and crisp. Lay them on kitchen paper to remove excess fat. 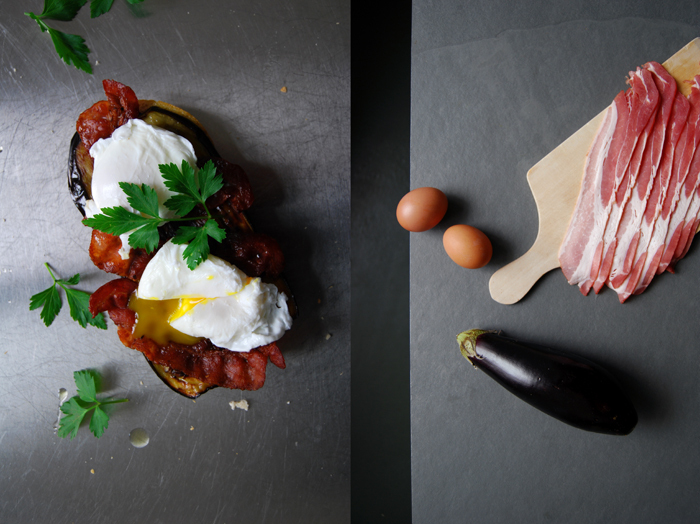 Put 2-3 slices of grilled aubergine on the bottom side of each bun and lay 2 -3 slices of bacon on top. In a sauce pan, bring water to the boil, add some salt and turn down the temperature, it should be simmering, not bubbling! Crack an egg open and put it into a small bowl. Put a large spoon (the largest you have) on the surface of the simmering water and gently pour the egg onto the spoon. Hold the spoon with the egg in the water and put the egg back into place with a second tablespoon if it slips off the spoon (I had to do this a couple times). It needs around 3 minutes. 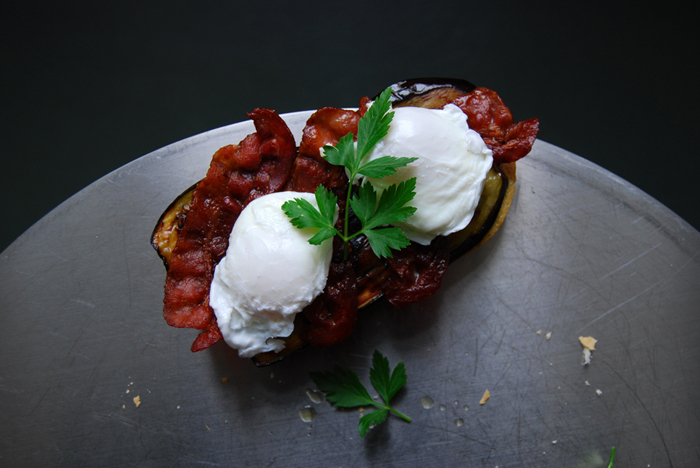 When the egg is done, take the spoon out, let the excess water drip off and carefully scrape the poached egg onto the fried bacon with a second spoon. Sprinkle with parsley, close the bun and enjoy! 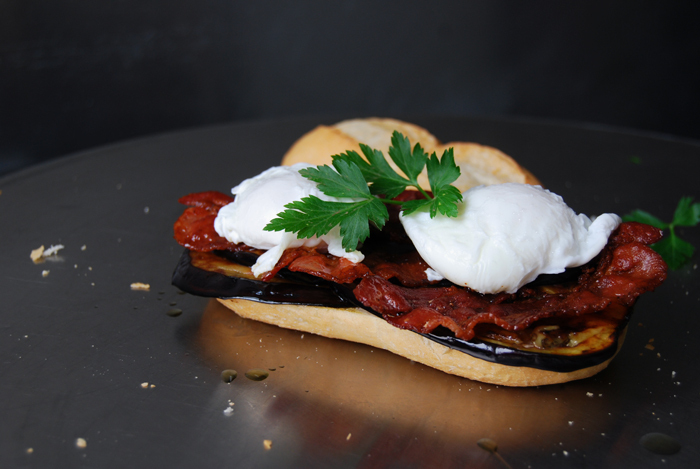 It’s best to poach one egg at a time but if you are impatient, you can cook two at once. In that case, let the first egg float in the water after cooking it on the spoon for 1 1/2 minutes (mind that it doesn’t stick to the bottom when you let it float). Poach the second egg on the spoon and take both eggs out after they have cooked for 3 minutes each. Meike, that looks so good, my kind of sandwich!